Bill Murray quietly turned 65 today. I really love Murray as a performer, he's easily the best onscreen clown of his generation. He is also somebody who nearly always reliable. Which makes picking his best movies for any type of list a chore. But, in order to celebrate this man's birth in style, I am going to crown his five best movies. Just in case you guys are planning a mini-Bill Murray fest. Now, there is one movie I am going to purposely leave off and that movie is "Ghostbusters." Not because I hate it, far from it. "Ghostbusters" is my second favorite movie of all-time, a movie that has been part of my life forever. If you've been following this blog, I have written hundreds and hundreds of words of my love of the flick. It would be a no-brainer to make it my number one pick. The thing is, Murray's career has been so rich, so full of life, that I purposefully wanted to include other movies. This is definitely my numbers 2-6 of favorite Bill Murray movies and "Ghostbusters" is my given that will be missing in the top spot. 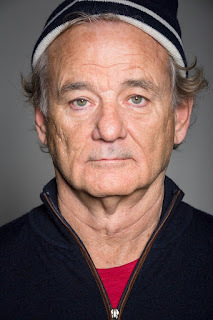 With no further ado, my favorite Bill Murray movies. This list could be overloaded with Wes Anderson movies, but I think "Life Aquatic" is the movie where Murray was given so much to do. With that material he was more alive in this than any other Wes Anderson. Not only that, but I love all the colors, all the style and all the energy on display in this little gem. The film maybe offbeat humor, but Murray picks it up and runs with it, and with an impeccable cast with him, he surely shines. This movie is barely talked about and rare to find, and I think that's a shame. I saw this movie on cable when I was really young. I remember clearly the opening scene of Bill Murray stepping into a bank, dressed as a clown. I hated clowns all my life, but something drew me obsessively to Murray's character. That was Murray's greatest achievement, he could get you to buy into any character he played, whether they were good or bad, and that was just one of the many greats in this little comedy. This maybe a movie that Murray only has a couple scenes in, but the scenes he's in are so good that you have to see them. Even though this is a movie flooded with great comedic performances, Bill Murray's battle with beavers sticks out in a very big way. I love every moment Murray is in and sometimes I will skip right to his scenes. "A Christmas Carol" has been redone and redone and redone over the years. You can bet that it will be redone and redone and redone more in the future. Of all those interpretations of this classic story, I like Murray's movie the best. Not only is incredibly creative, but you can feel, literally feel, Murray's character and his complete transformation. He earns every emotion he creates in this movie, and I feel it every time I watch the movie. This is a Christmas movie I can't help but watch every year. I love this movie. While I think that "Scrooged" is an incredible performance, I think the character Murray plays here is just as great, if not better. Murray is a master in adapting into any background or style that he chooses to get himself in. He isn't just a goofball in every movie. In this, he's just an ordinary man who finds himself in an extraordinary situation. His performance feels very human and natural, even though the premise is a little crazy. Murray is good at getting the audience to buy into any situation he's in, and this was no different. So there you have it, my favorite five Bill Murray movies, minus "Ghostbusters." What do you guys think?